I hate Halloween. There, I’ve said it. And if you tell my children I said it, I’ll call you a liar and deny it till the day I die. To my Mom’s credit, she participated in the pagan ritual of Halloween despite her feelings. She knew I liked it, and she did what she could. 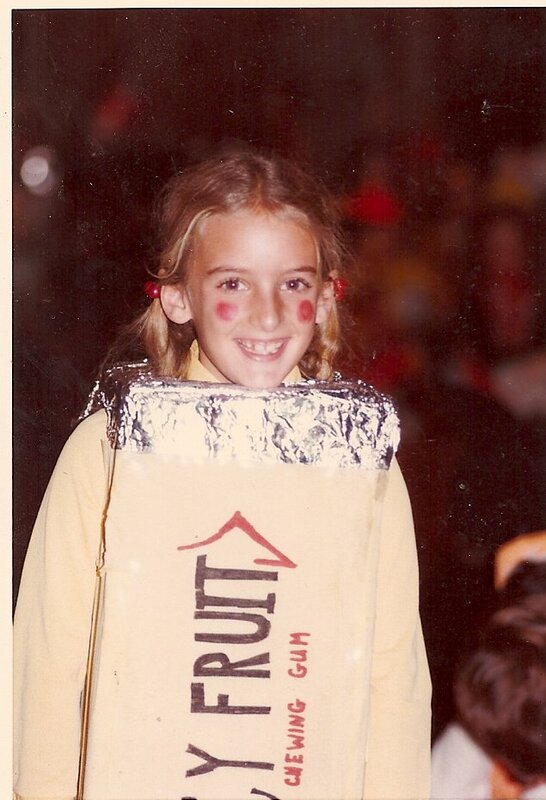 That included turning me into a stick of Juicy Fruit. Yep, that’s me, circa 1974. I’m sure she hated every minute of it. But she did it to make me happy. And now, (since every day I am turning into my mother more and more), I’m “doing” Halloween, even though I hate it. I hate the begging aspect (thanks for pointing that out, Mom.). I hate the mandatory quality of the holiday: I must smile at children on a chocolate high so intense they are hallucinating. (LSD = Lots of Special Darks.) I must let my own children have more candy than I think is wise. I must act thrilled to answer my door at 8:30 at night so that the kids in my building can get candy that their parents don’t think they should have either. It’s like I’m wearing a costume without ever changing my clothes. I’m going as “Woman Who Really Likes Halloween.” A more realistic costume might be “Halloween Hating Witch.” I’d have an exasperated look on my face, a bag of organic tofu snacks, and a doorbell specially rigged to say “go away” when you pressed it. But I am SO “doing” the Halloween thing that I am running our building Halloween party. I do it every year. I order supplies, make up goody bags, decorate the lobby, order pizzas and juice and then clean it all up afterwards. Now that I see it in black and white it doesn’t sound like that big a deal. It’s just that since I’ve done it for the past forever years, people expect it of me. Someone called me THIS MORNING, to ask if I could get those pop-up ice-cream cone pumpkins for the goody bags. Halloween is tomorrow. Hello. I started all this in AUGUST. No kidding. I ordered everything the moment I got the first of my 147 Oriental Trading catalogues. Because while it might seem simple, nothing is simple. We’re mothers, we know this. First of all, there are the kosher kids. They are observant, therefore, they can only eat kosher candy, and I can only order kosher pizza. But if they were that observant, they wouldn’t be celebrating Halloween at all, like the kids on the fifth floor, who look at all of us lesser Jews with disdain as they pass by in their own sort of perma-costumes: black hats on thirteen year old boys, dresses that cover knees and elbows on three year old girls. But that’s judgmental, “Halloween Hating Witch” rearing her ugly head. I have the utmost respect – envy even – for people who truly have and adhere to their faith, which these people obviously do. I cannot imagine how hard it is to be seven, pass a party in your own lobby and not be able to join in. But the must-have-kosher-pizza-and-candy but I’ll run around in a Ninja costume on a holiday of dubious origins types? I don’t think so. Then, there are the people who want to “help.” But they work until 6:30 and don’t get home until 7:15. And they’re not very good with their hands and they can’t really bake, either. What do they want to do? Write me a cost-basis analysis of the party so the building can save 72 cents next year? There’s the one kid who inevitably gets hurt in the sugar induced frenzy. The kid who doesn’t like what’s in his goody bag and wants me to give him something else. The parent who tells me – during the party – that their kid is lactose intolerant and do I have any soy cheese pizza. We’re in the lobby, lady, go upstairs and get your kid something to eat. Then there’s my personal favorite: the people without children who complain that we take over the lobby for our pizza party every year. We take it over for forty-five minutes once a year. You don’t like it? Move to Connecticut. one who set all this up. And it makes it all worthwhile. Yeah, right. Maybe if I were starring in a movie on the Hallmark Channel. Hey, I want them to be happy, I really do. I’m happy that they’re happy. And I’ll keep on doing the party. But I’ll also keep on hating Halloween. Just don’t tell anybody, ok? I agree know that i am a mother i hate Halloween as well what is even worse is that i work at a drug rehab facility and we all have to dress up as well. I think you should go as a disgruntled employee!